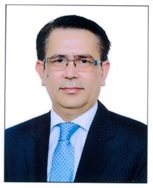 Mr. Khalid Umar has more than 20 years of experience which includes 14 years at managerial positions at PPIB. He is currently leading HR/Admin Section of PPIB, his current role is to contribute in the alignment of all functional area objectives to strategic objectives of the organization. He has active participation in all decision making processes at strategic and functional levels. He has a leading role in the procurement and logistic arrangements for all operational needs. He is also the part of the team to formulate HR planning and operational strategies, and for devising compensation package for PPIB employees. He has rich experience of different industries which include customer services oriented organization like Islamabad Marriot Hotel, foreign mission like British High Commission and now with public sector organization. He has obtained MS degree leading to PhD in Management with high grades. Moreover, he has acquired many professional training courses and workshops from well reputed local and International institutes like East Birmingham College UK, Foreign and Commonwealth Office UK, Global Training Consulting (GTC) UK and many local organizations like LUMS, British Council, Schuitema, PIMS, SDPI, Franklin Covey etc in the field of Management, HR and Leadership etc. He is member of Society for Human Resource Management SHRM USA.